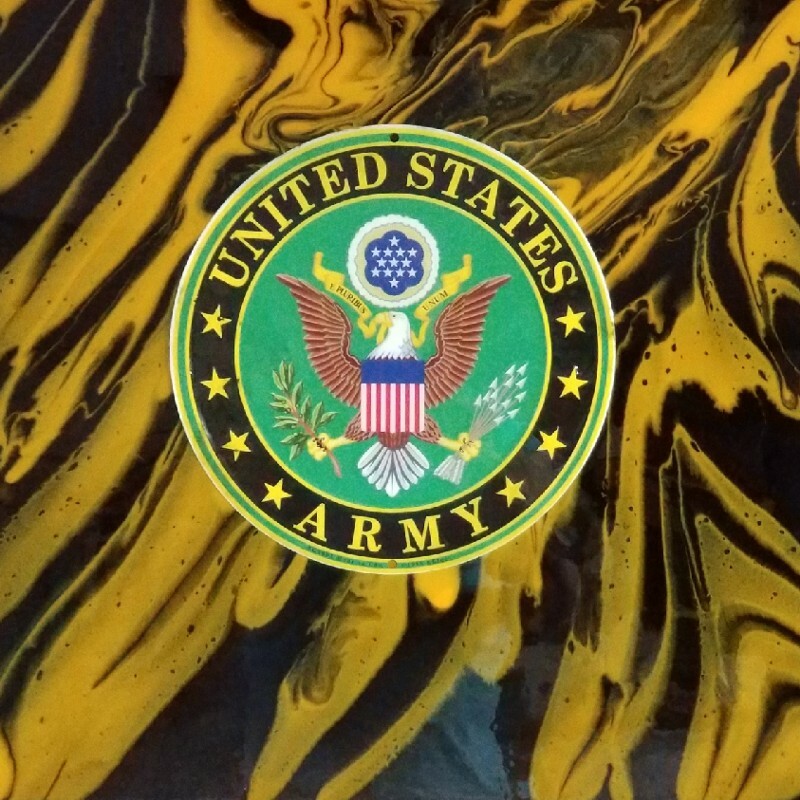 Five new paintings by Amarillo-based artist and Veteran Mark Aldrich were unveiled at 1:00 p.m. on Sunday, November 11, during a signing ceremony at the Texas State Veterans Home in Amarillo. 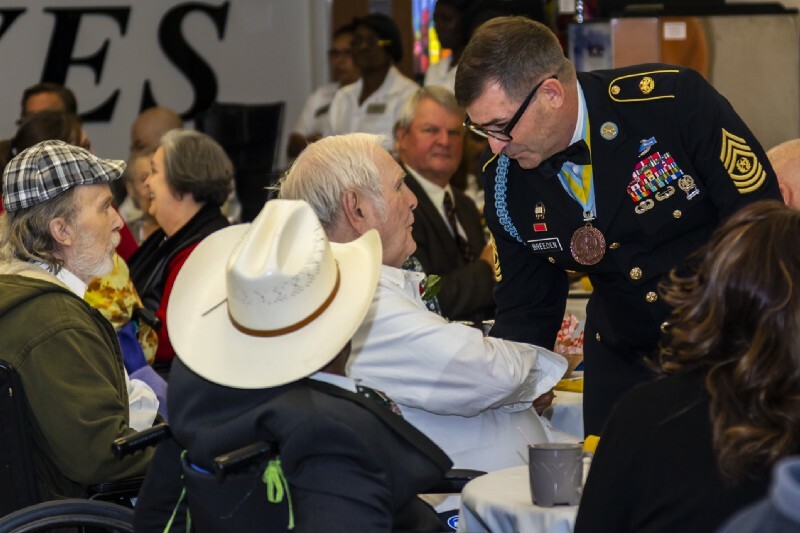 This Veterans Day event was open to the public and a reception followed the unveiling. 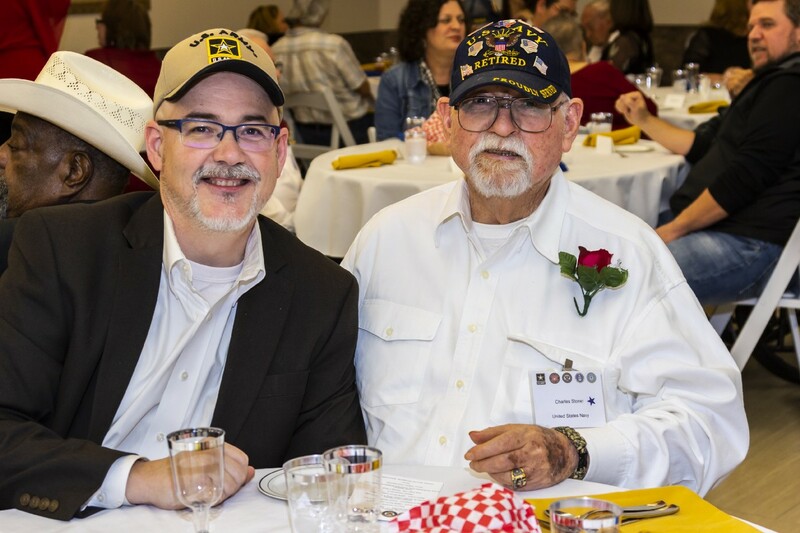 Aldrich is a U.S. Army and Air Force Veteran from Oregon who served a total of 17 years in the military. 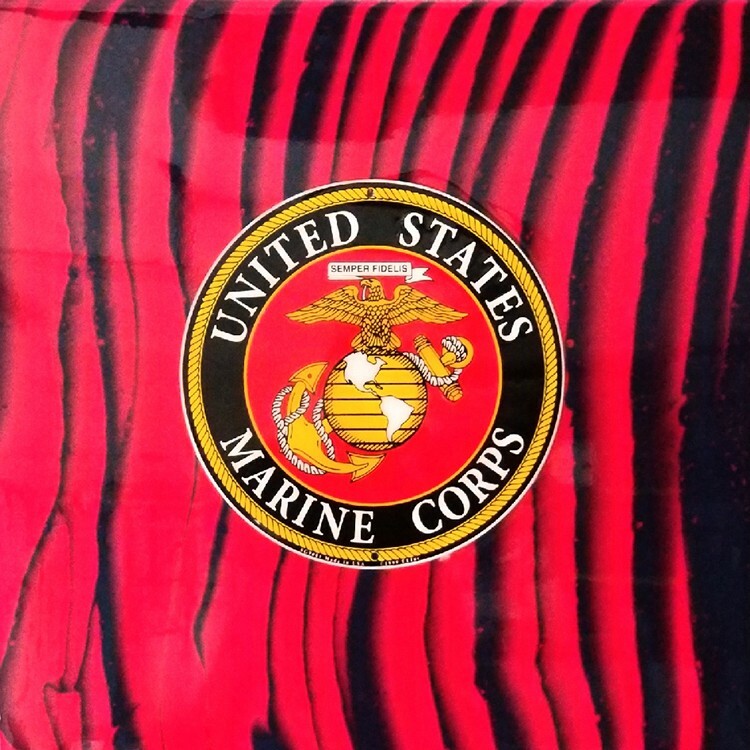 He began his art career in 1990 as a frame shop manager. 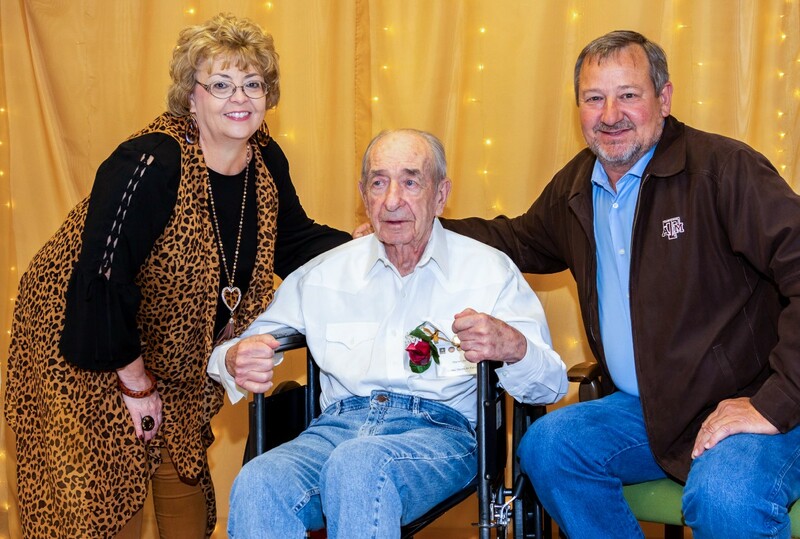 Aldrich is the owner of MK Aldrich Art Gallery in Amarillo. 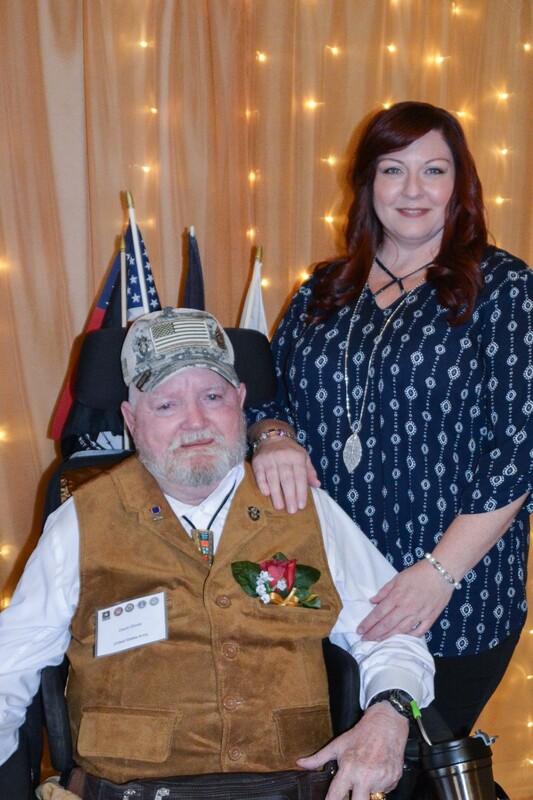 He was commissioned by the Texas Veterans Land Board (VLB) to create five custom paintings, depicting each military branch, which were signed by each Veteran based on their branch of service as a permanent legacy at the Ussery-Roan Texas State Veterans Home. 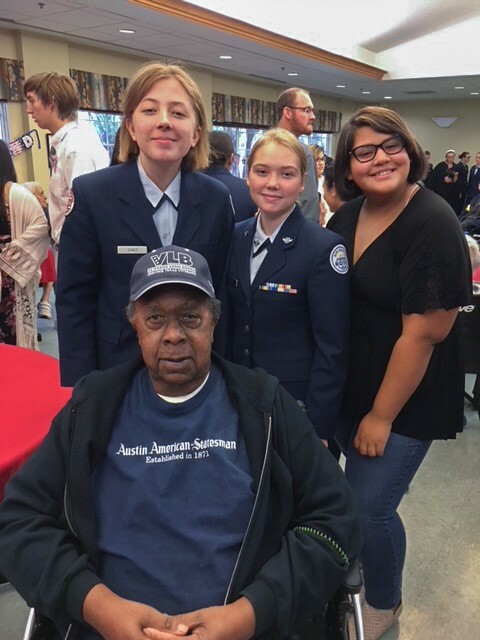 On Veterans Day, fifteen Veteran residents from the attended the VA’s annual Welcome Home Event as part of the Veterans Day festivities. 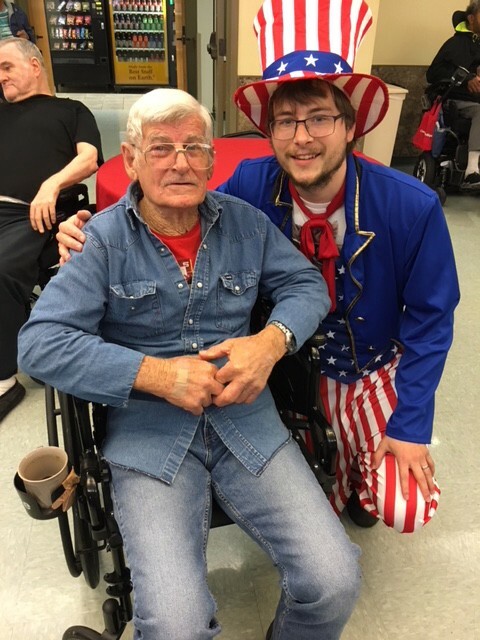 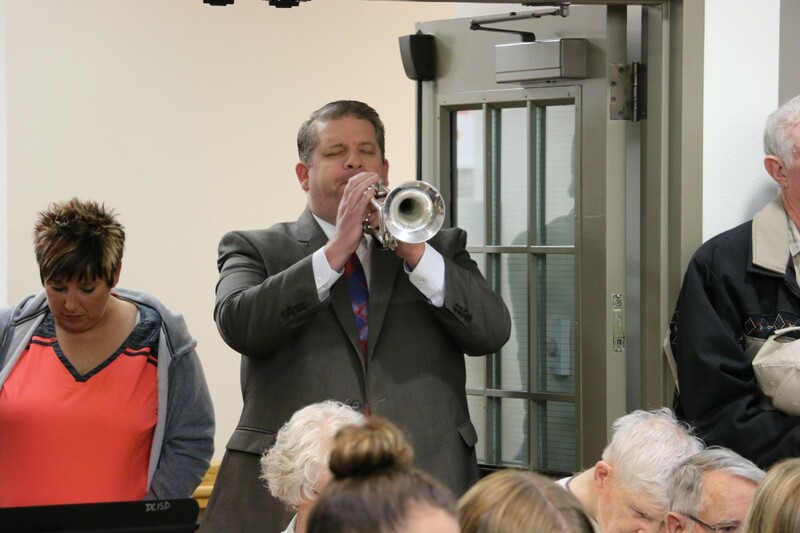 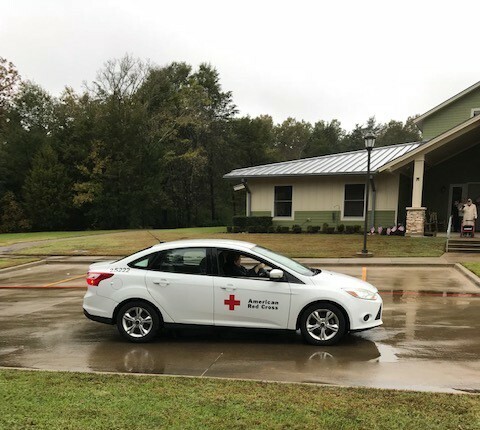 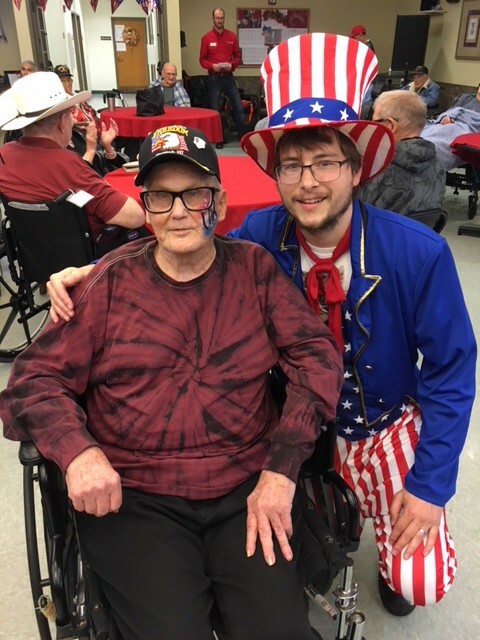 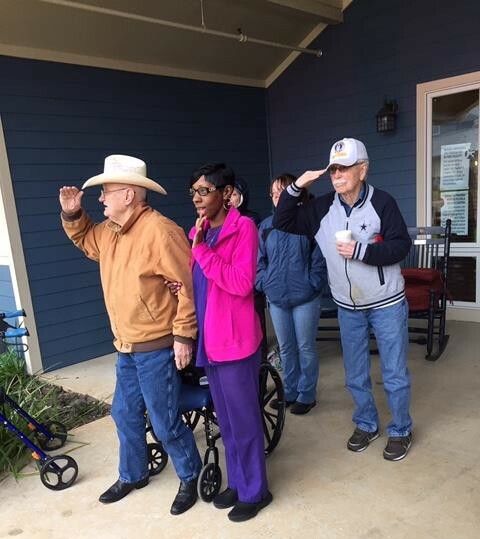 The Texas State Veterans Home in Bonham hosted a Veterans Day ceremony and barbecue luncheon for the residents, area Veterans, and the public on Monday, November 12th. 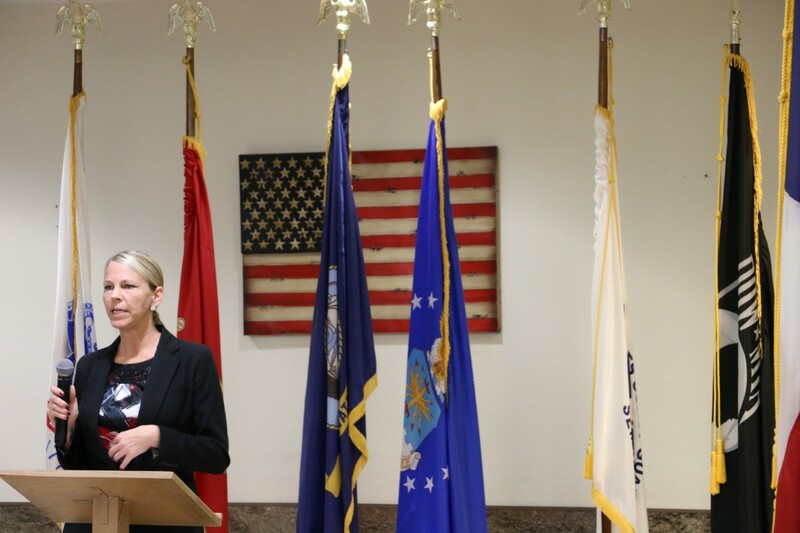 The guest speaker for the event was Seaman Synthia Morris. 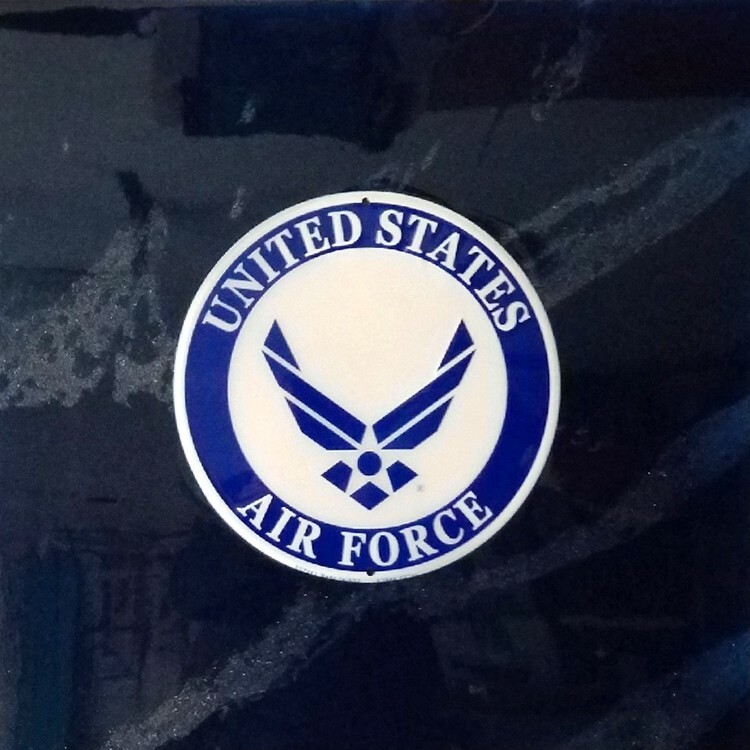 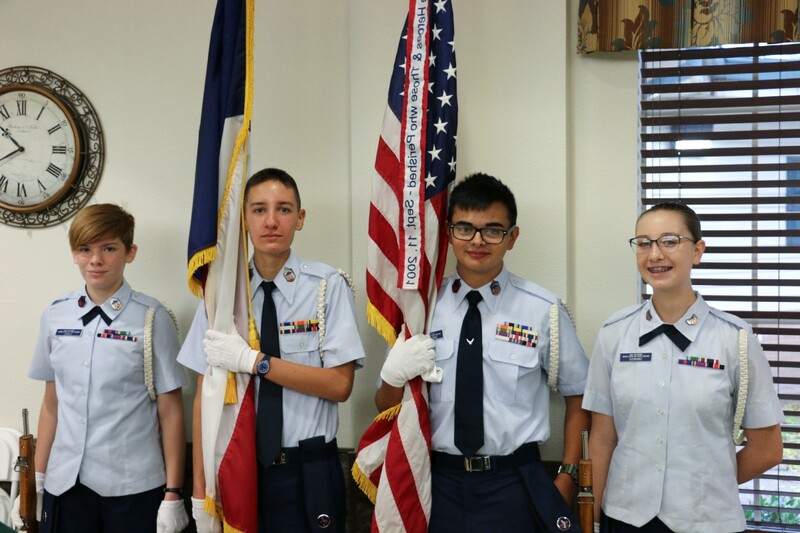 The ceremony also included the Texoma Composite Squadron-262 Civil Air Patrol, the Dodd City High School Band and the Combat Veterans Motorcycle Association Chapter TX 23–1. 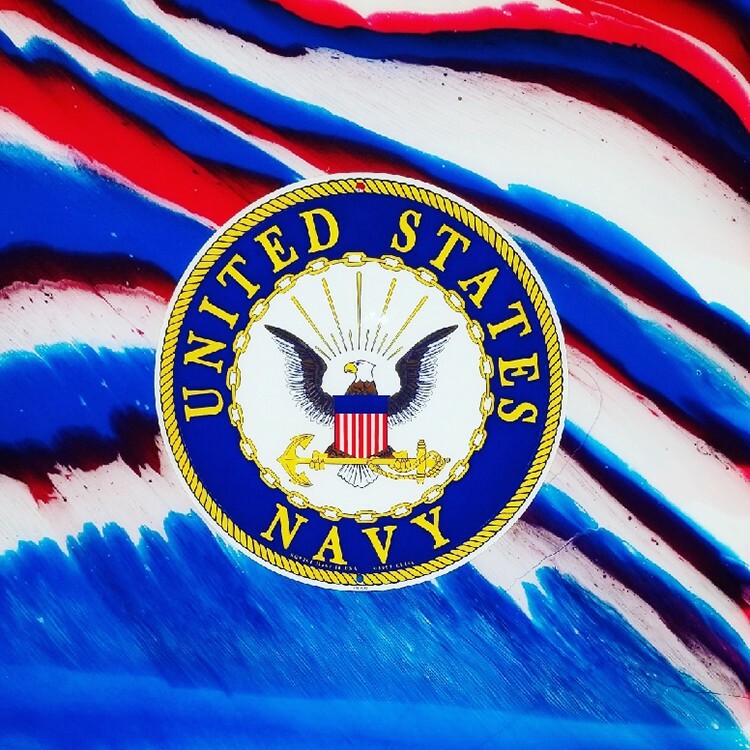 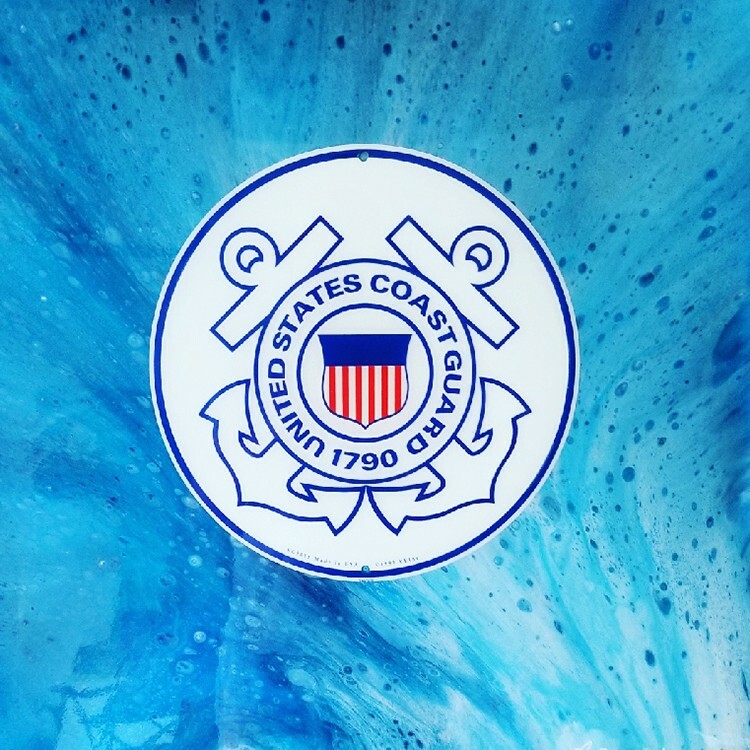 Seaman Morris began her training with the U.S. Navy in 1995 at Recruit Training Command in Great Lakes, Illinois. 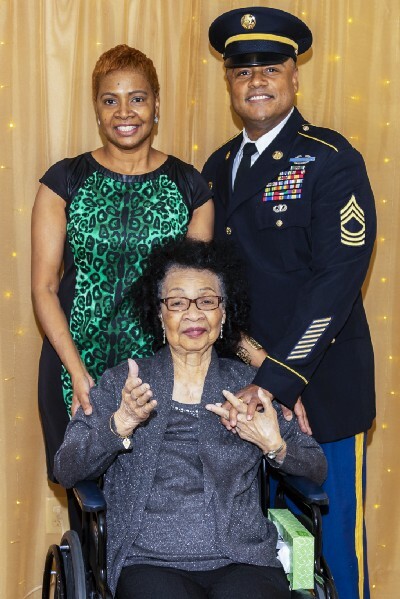 While serving as a military dependent, she earned a bachelor’s degree in General Studies with double minors in Marketing and Human Resources. 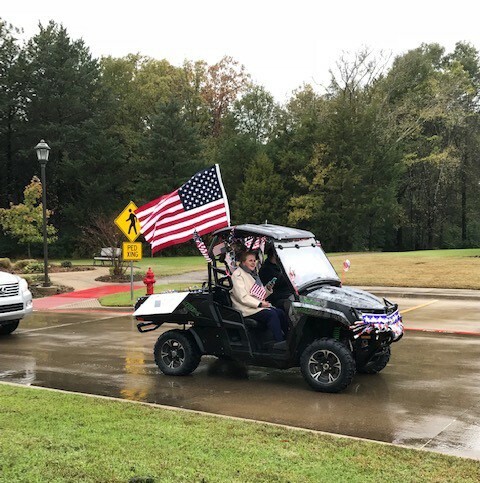 While stationed abroad as a military dependent, she graduated from the University of Oklahoma with a master’s degree in Human Relations. 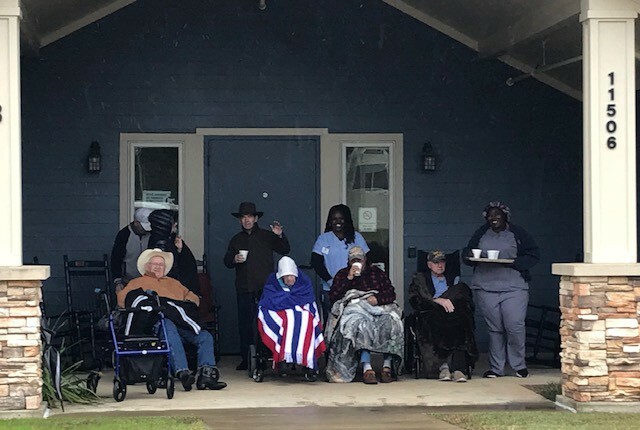 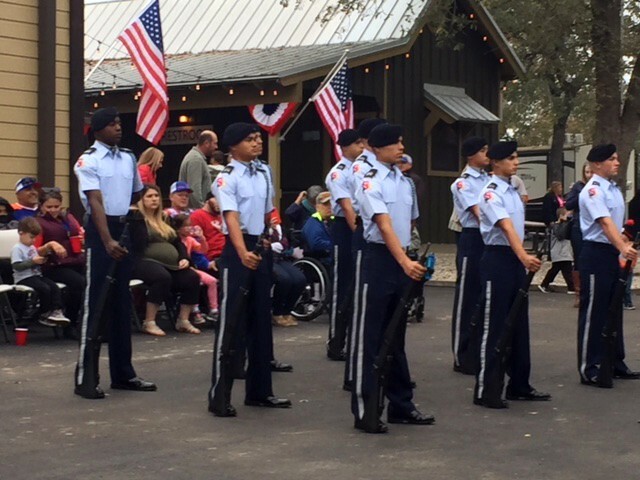 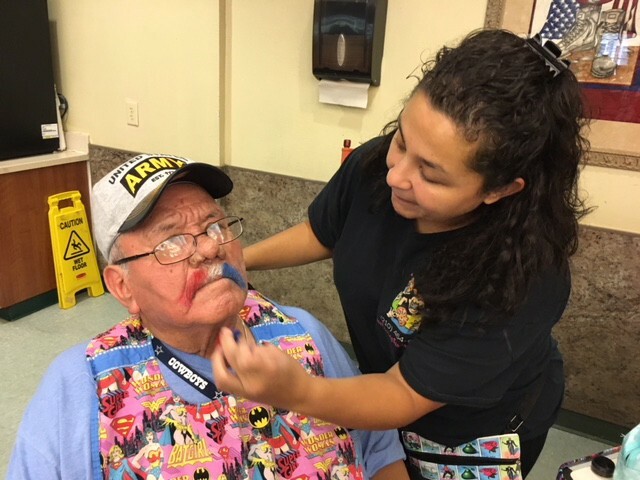 The Texas State Veterans Home in Floresville hosted several events Friday through Sunday in observance of Veterans Day. 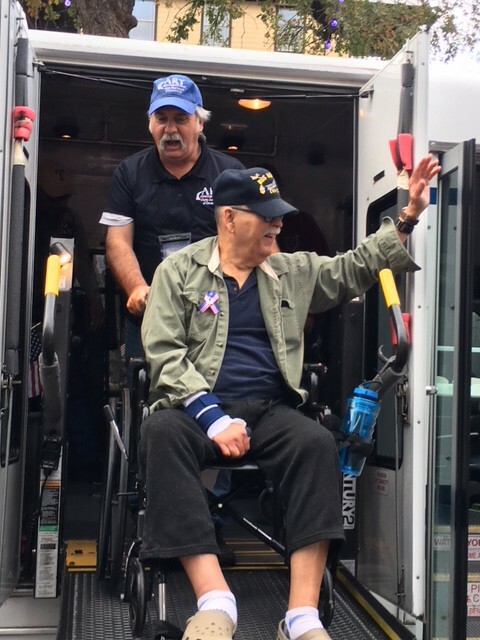 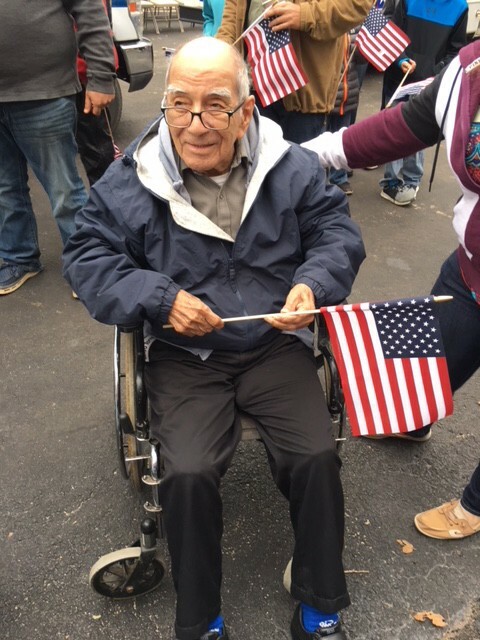 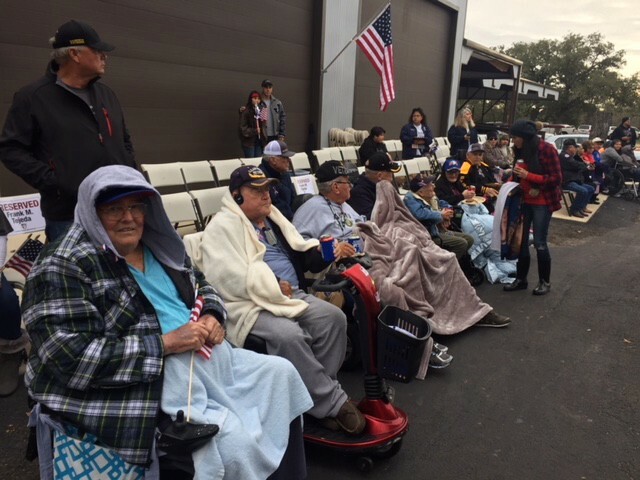 The festivities kicked off on Friday, November 9, when we sent 30 Veterans Home residents to the Wilson County Veterans Day Ceremony at the Floresville High School Stadium. 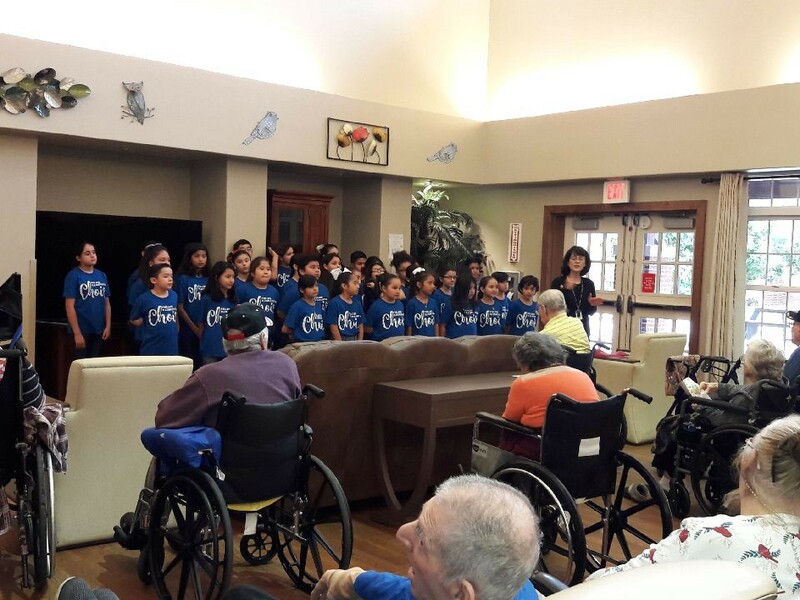 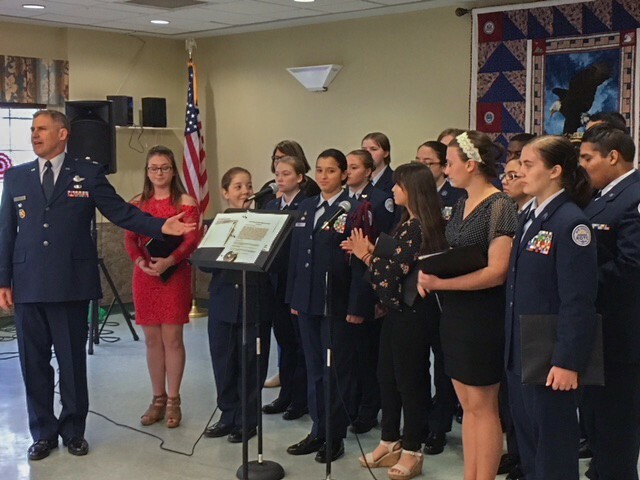 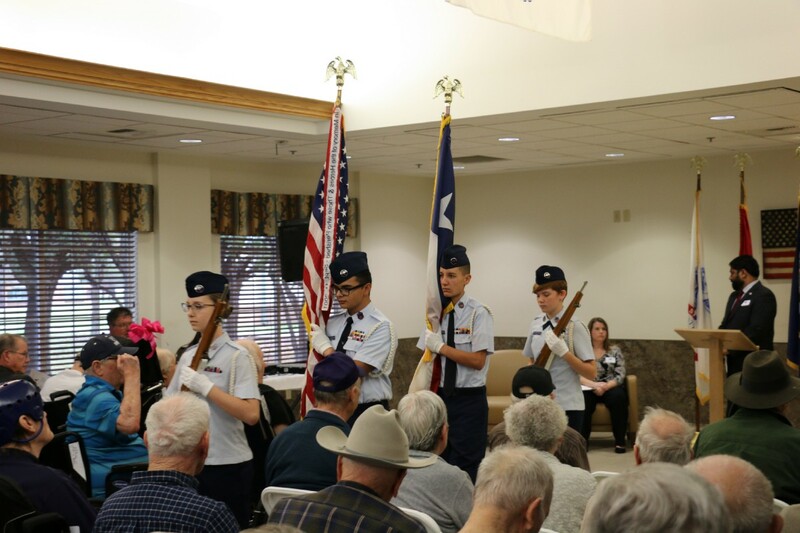 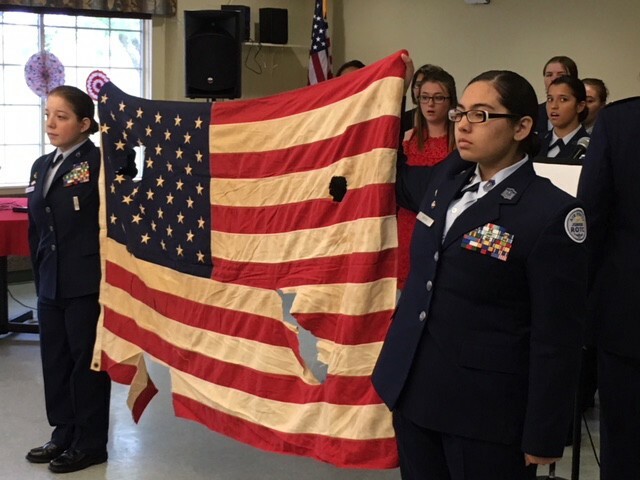 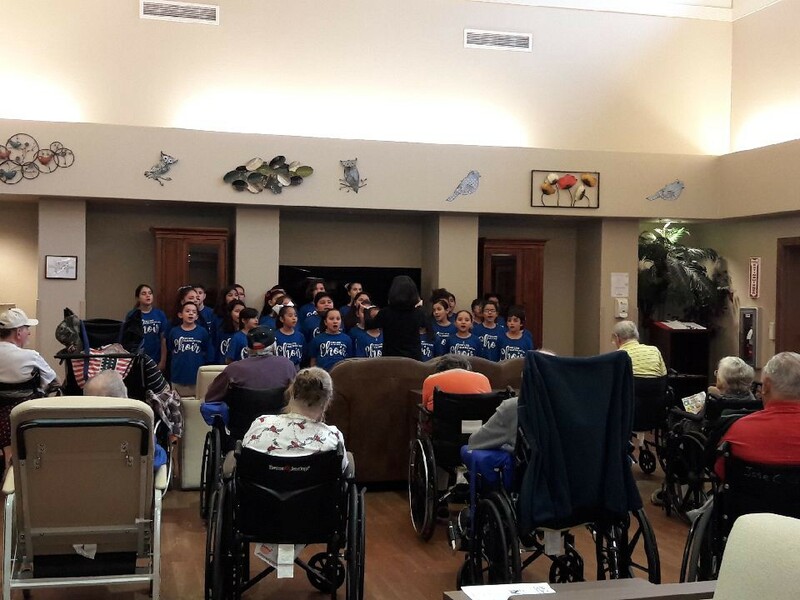 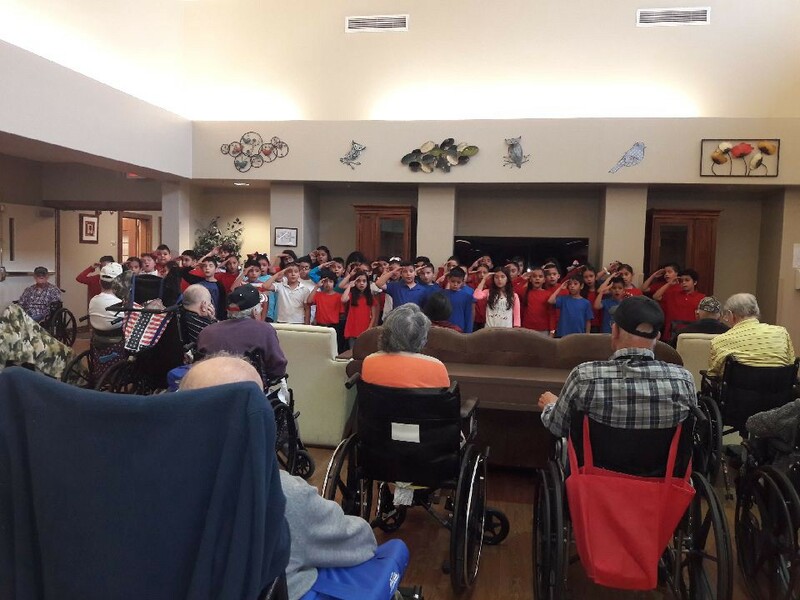 This was followed by a musical performance at the Texas State Veterans Home by the Floresville High School Air Force Junior ROTC and directed by Col. Steven Rakel. 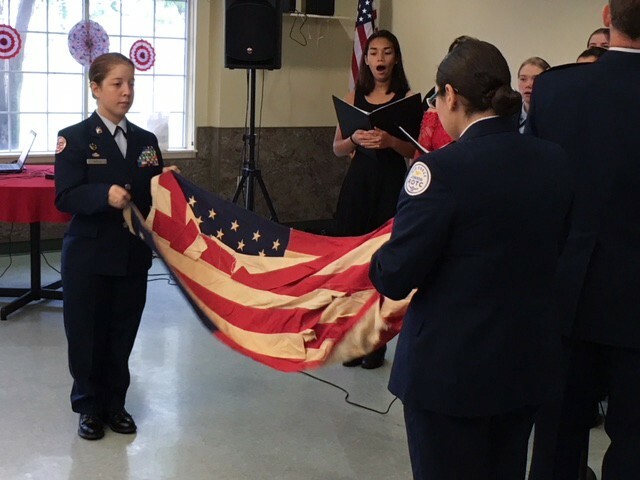 The 45-minute performance included the National Anthem, Airforce Blue, This is My Country, This Old Ragged Flag by Johnny Cash complete with interpretive movements, Till the Last Shots Fired, Amazing Grace, Ballad of the Green Beret, You Raised Me Up, Patriot Medley, Service Medley and God Bless America. 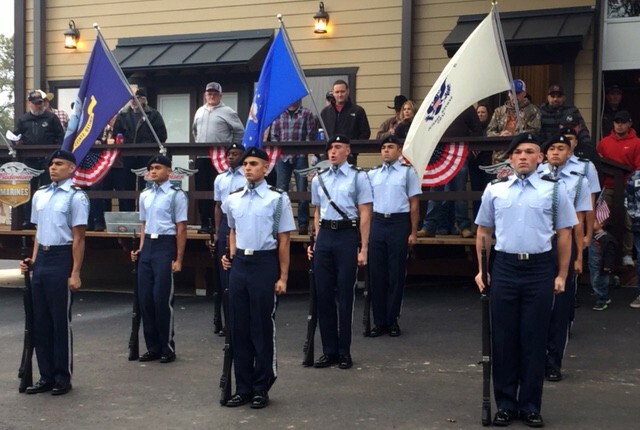 We appreciate this group so very muc, what a talented and patriotic group of young men and women!! 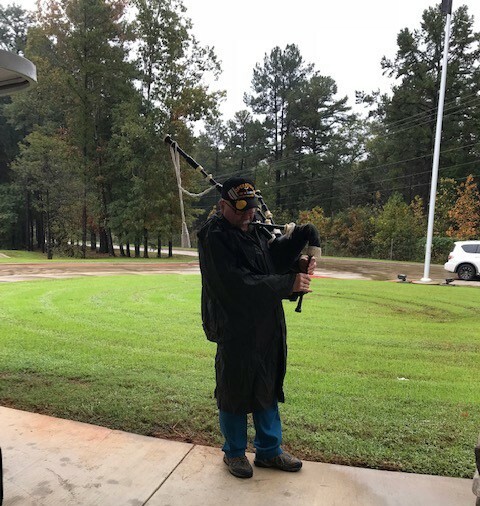 10:00 a.m. 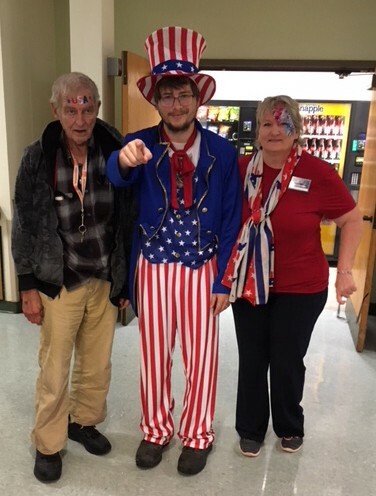 There were face painters in the morning followed by a barbecue lunch at noon and even Uncle Sam made an appearance. 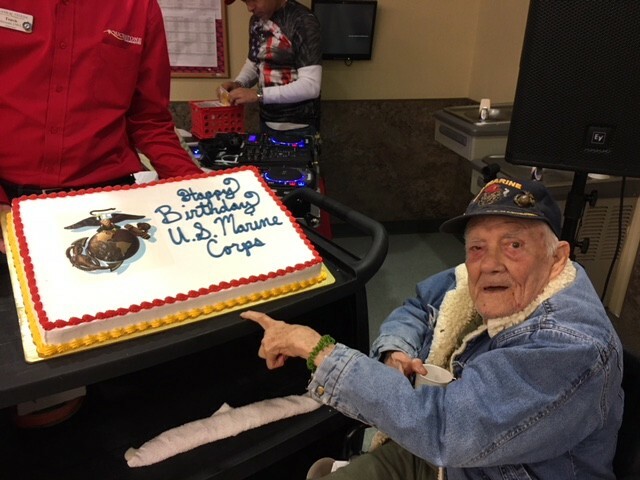 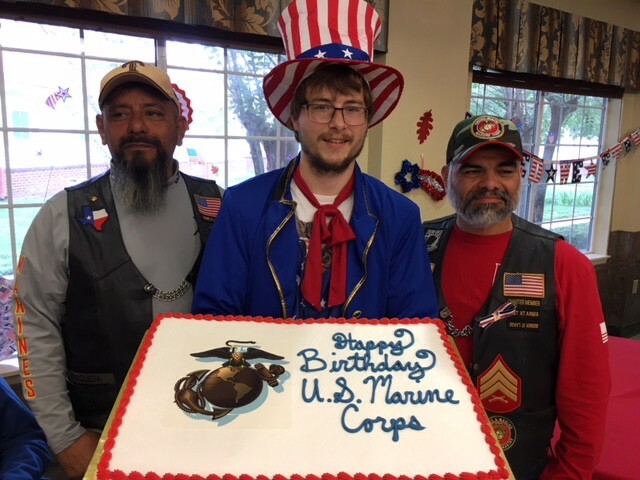 We also recognized the Marine Corps birthday with a beautiful cake, a happy birthday song, and a performance of the Marine Corps Service Song. 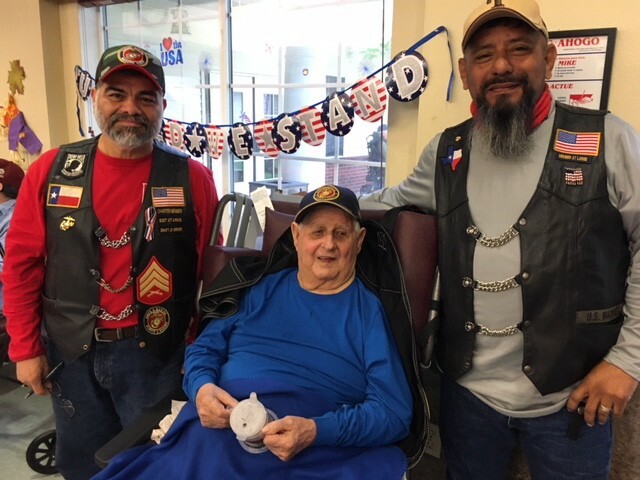 Residents who are Marines had their picture taken with two marines from the American Legion Riders of Seguin. 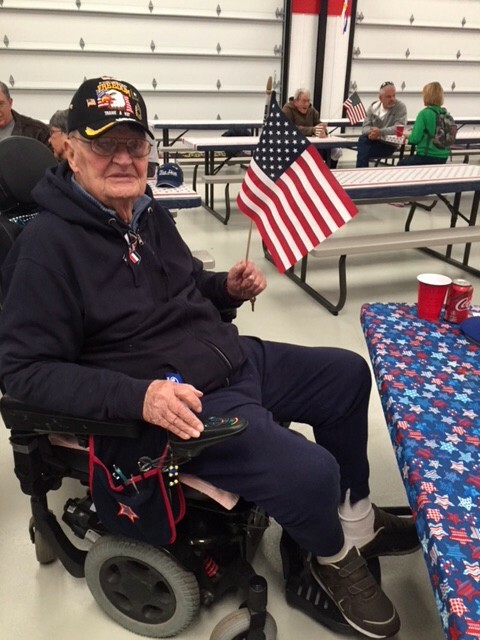 A BBQ lunch of delicious chicken quarters and sausage with all the fixins followed. 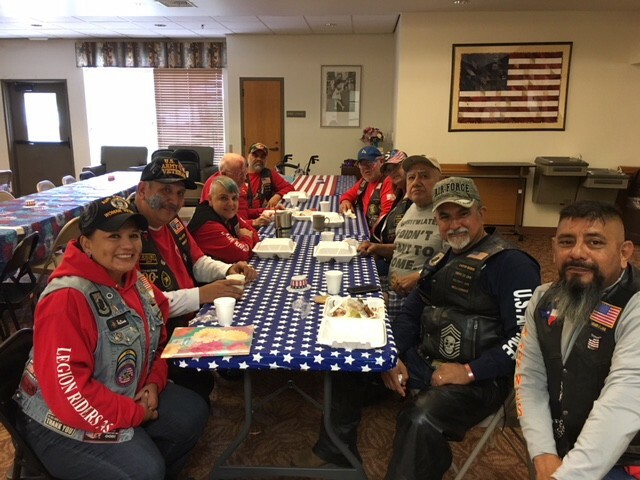 A big thank you to the American Legion Riders of Seguin who visited and loved on our Veterans. 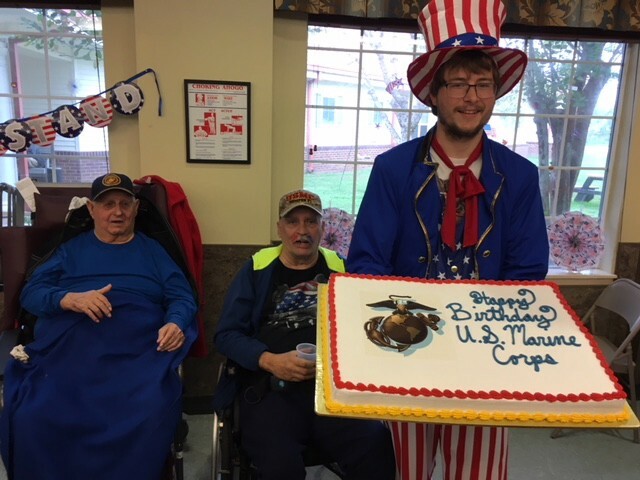 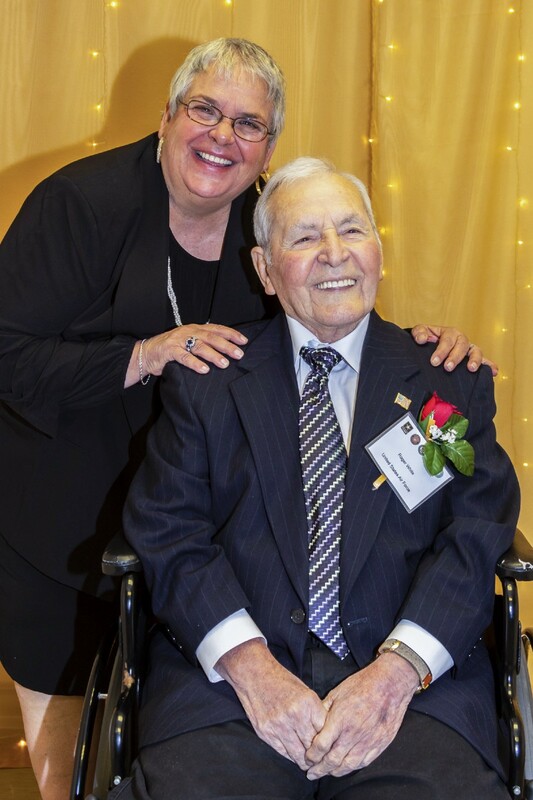 Thank you to J.D. 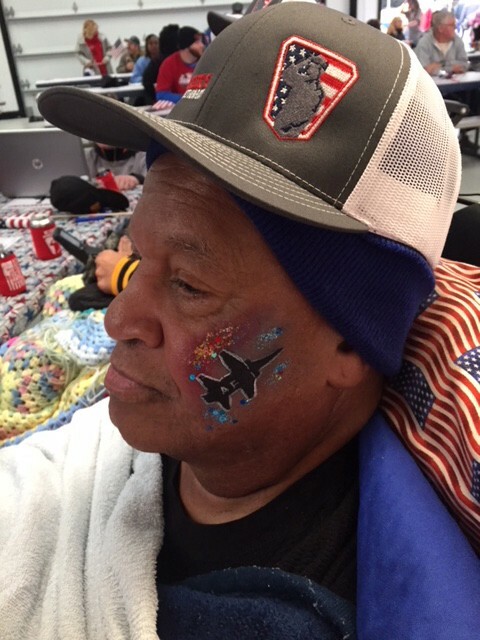 Davidsmeyer of JD’s Team Xtreme BBQ for staying up all night and cooking for us. 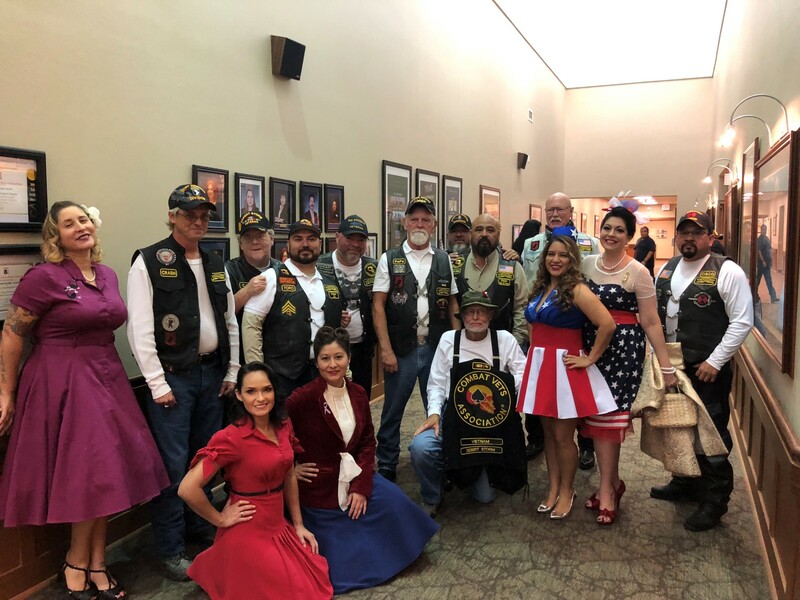 On Sunday, members of the Combat Veterans Motorcycle Association Chapter 23–3 escorted our Veterans to the Rackler Ranch in LaVernia for a night filled with food, fun, and entertainment. 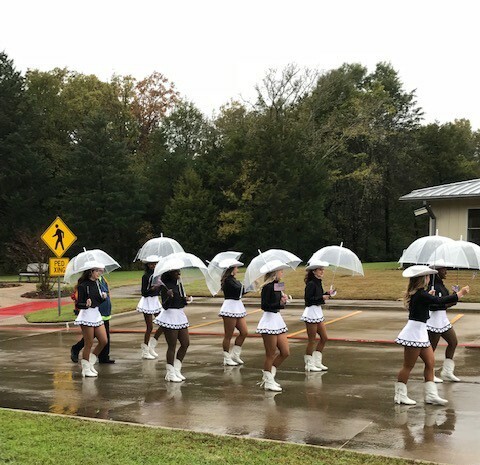 Our guys were given a heroe’s welcome followed by a spectacular performance by the award winning John Jay Silver Eagles Drill Team. 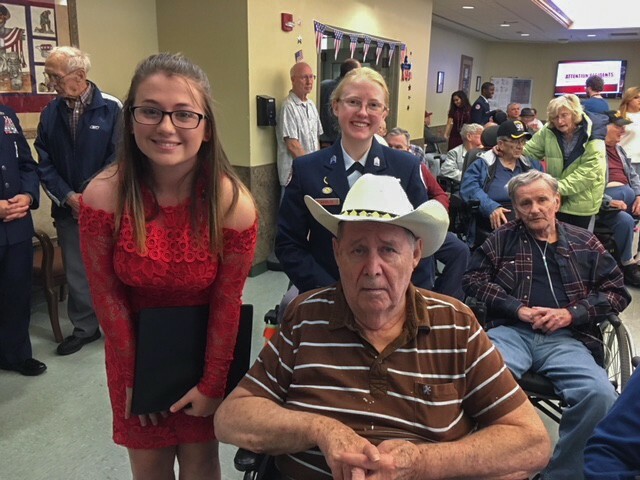 There was a slideshow that illustrated each service’s song during the service medley as well as patriotic songs, military marches, and a collection of classic Golden Oldies. 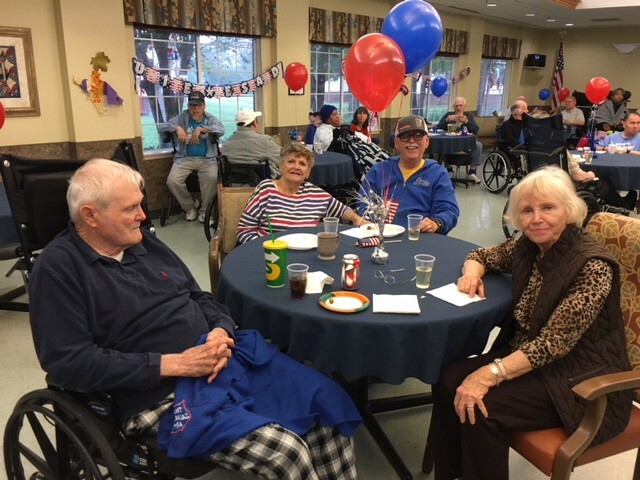 The residents were treated to a wide assortment of BBQ and sides. 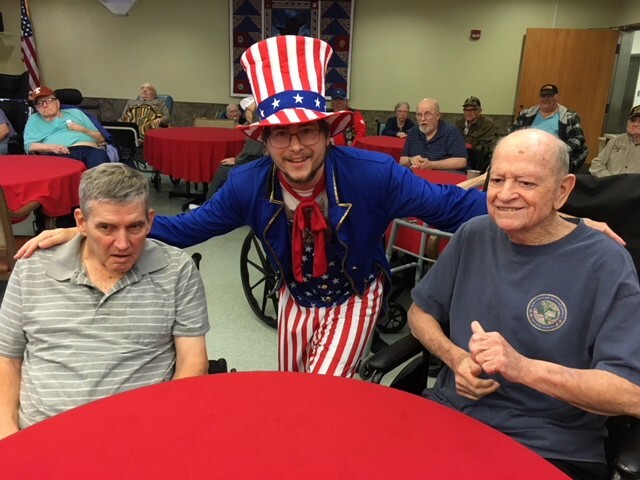 They had a terrific time. 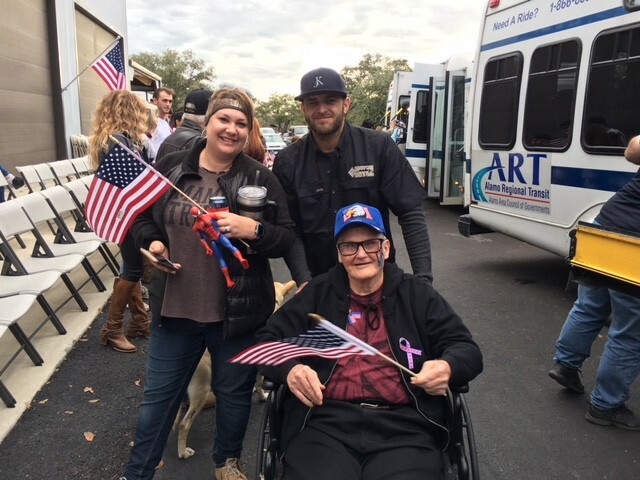 Thank you to Mr. Don Rackler, owner of Jon Wayne’s Heating and Air Conditioning Services for treating our Veterans so well! 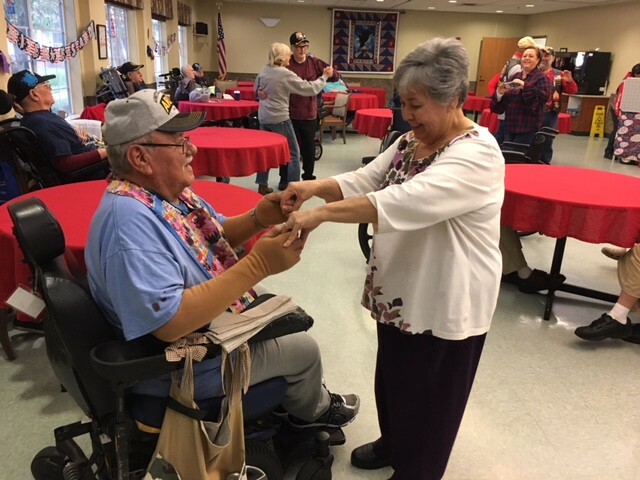 Erzulie Clarke and DJ Lori Alexander helped us celebrate Veterans Day back at the Veterans Home with karaoke and lots of fun patriotic music and sing-a-longs. 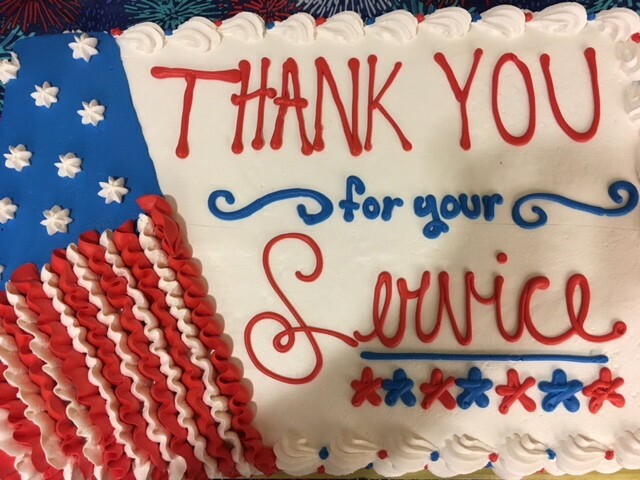 Also a huge thank you to our local Floresville H.E.B for providing the cake and all the food trays. 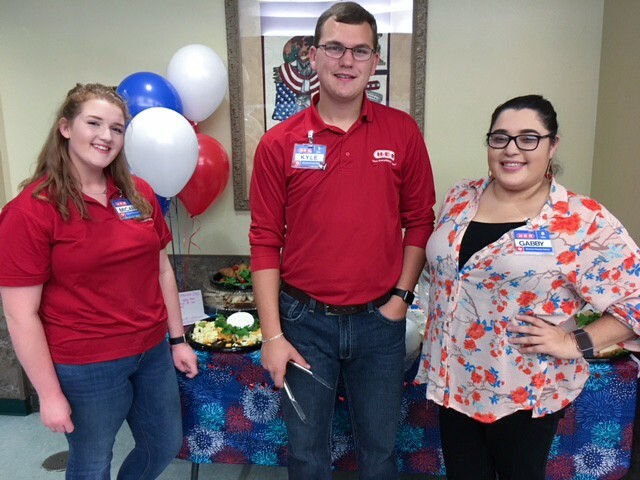 Micah Brannan, Kyle Maris, and manager Gabby Martinez helped ensure that everyone had something to eat, while also recognizing our Veterans for their service! 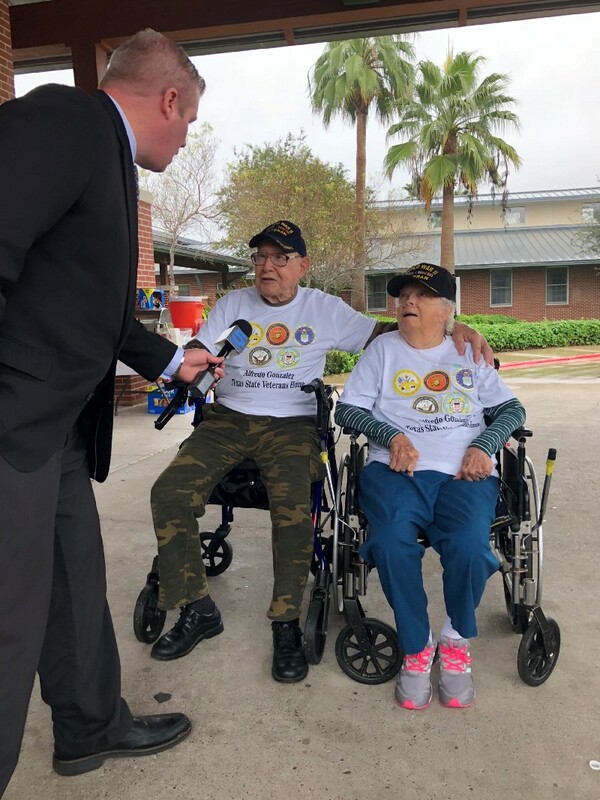 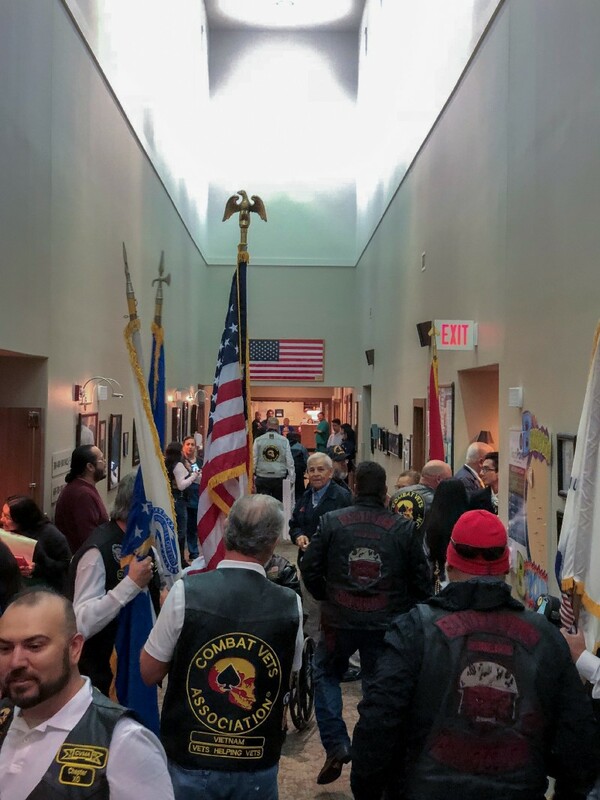 The Texas State Veterans Home in McAllen hosted a Tribute to Veterans on Veterans Day sponsored by the Combat Veterans Motorcycle Association Texas Chapter 23–15, RGV. 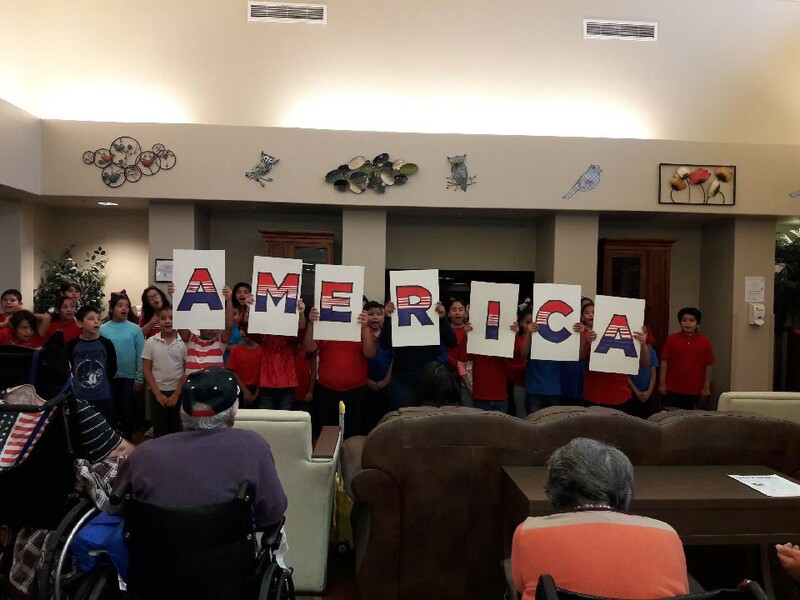 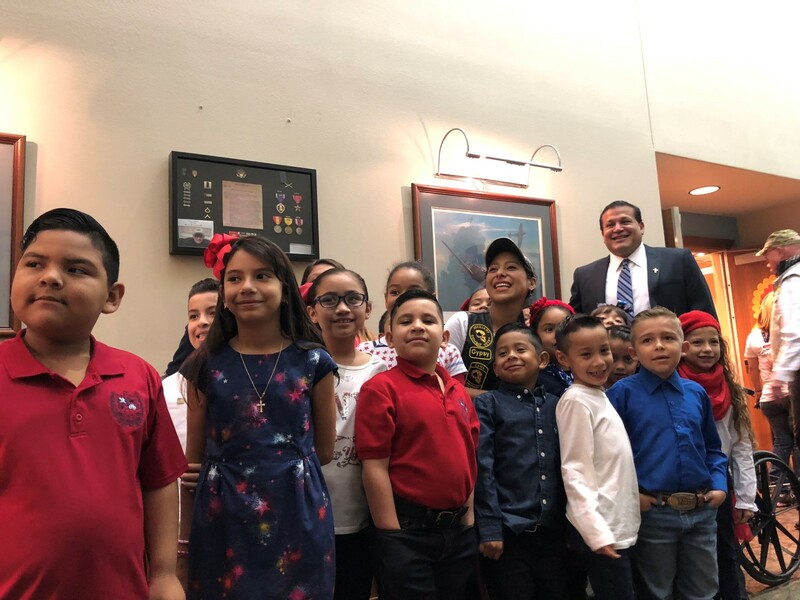 Students from Bonham and Fields Elementary Schools provided the musical entertainment. 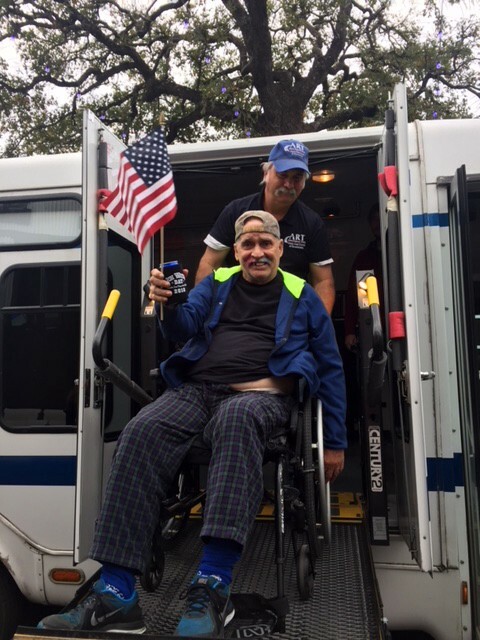 Many thanks also go to the Lion’s Club, American Legion, Pharr VFW and Jim Shaw for the gigantic flag flying from his crane. 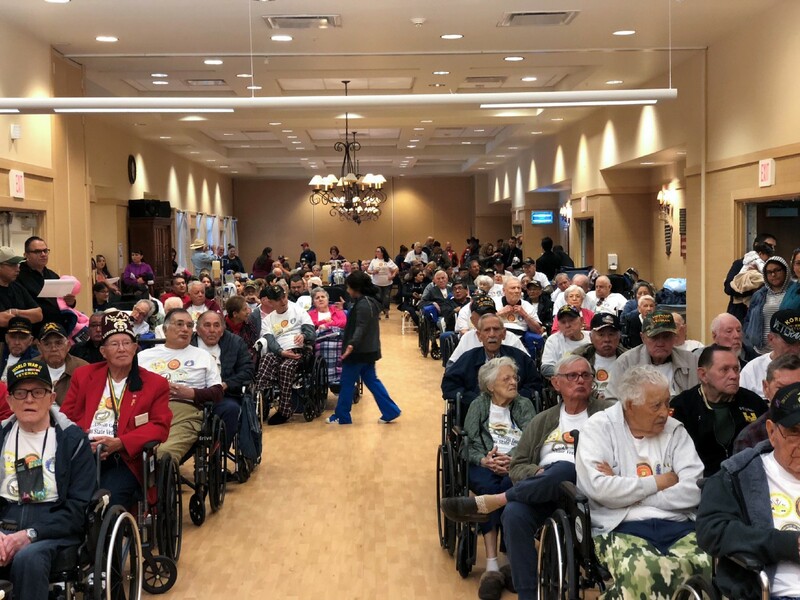 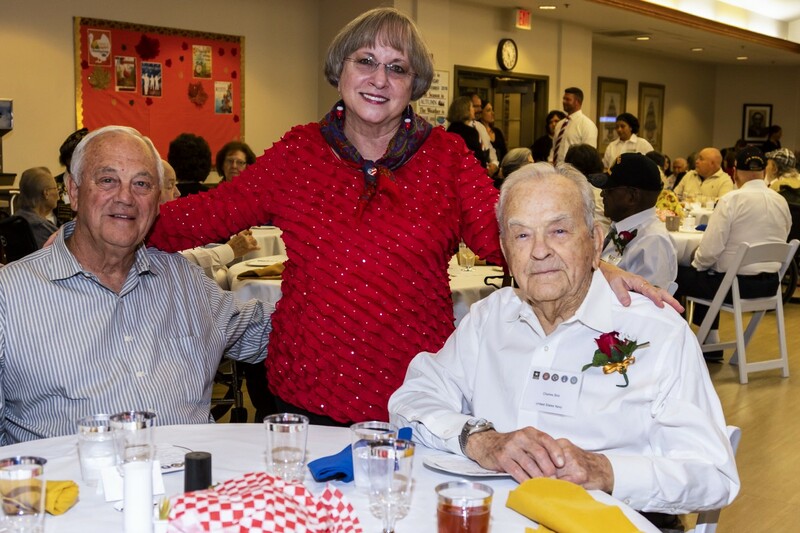 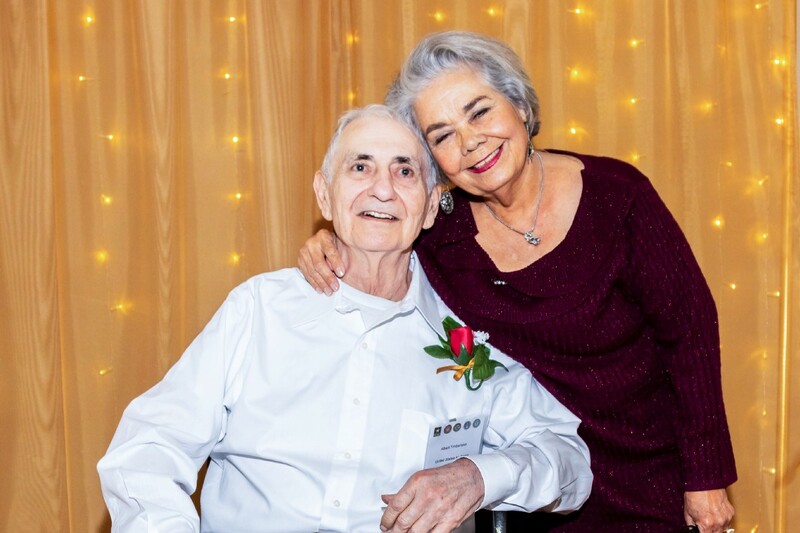 Every year the Texas State Veterans Home in Temple hosts a Veterans Day Banquet for the Veteran residents and their families. 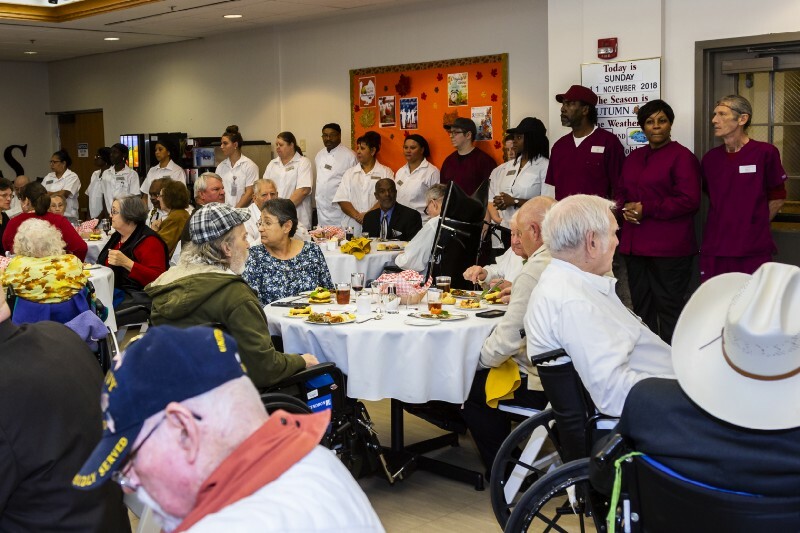 This year there were four separate programs for each dining room in the building and an extra dining room set up on A Wing. 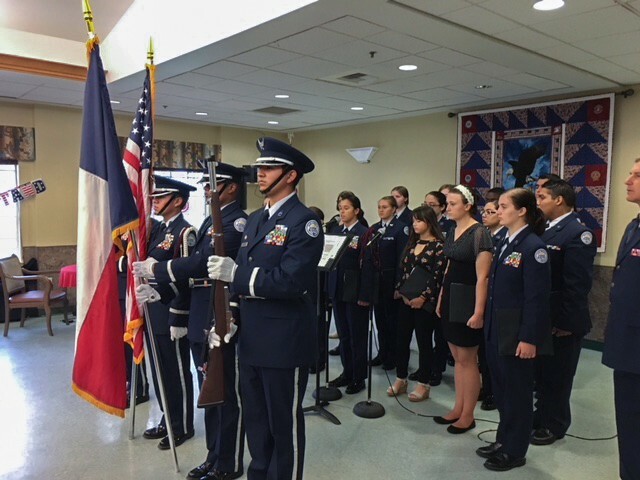 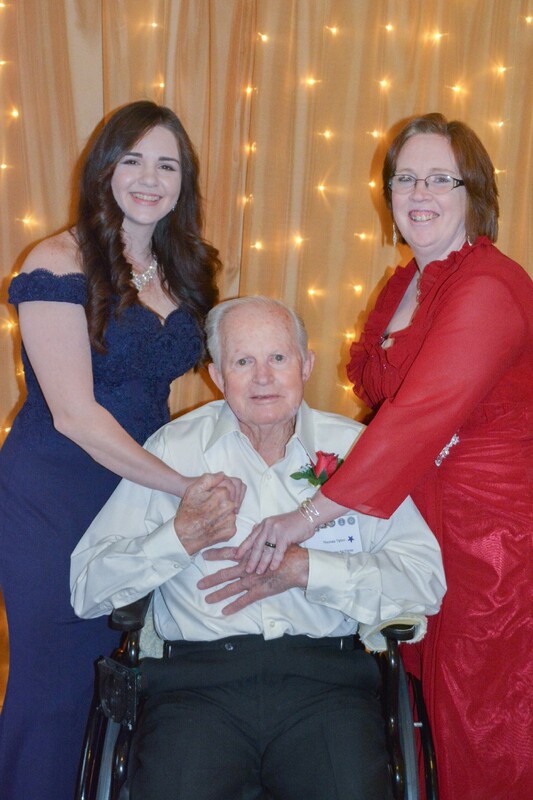 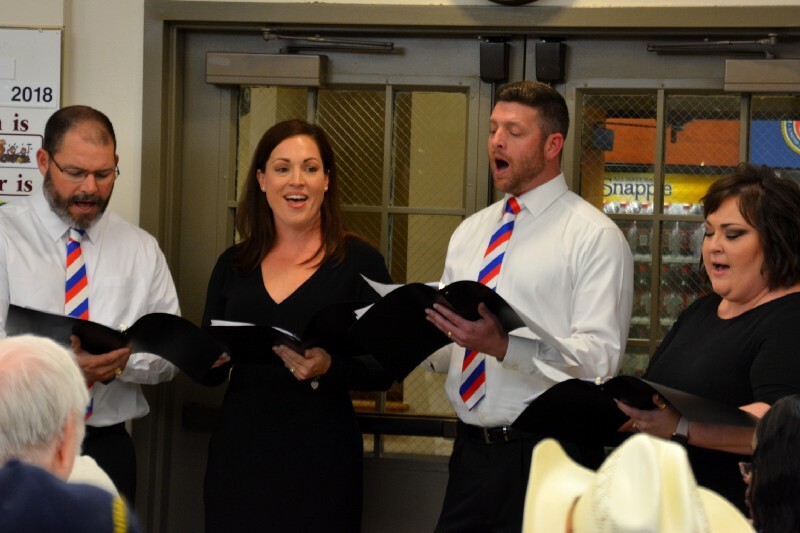 Each dining room had a program which included the University of Mary-Hardin Baylor ROTC Color Guard, a community Veteran guest speaker, and a quartet singing a medley of patriotic songs. 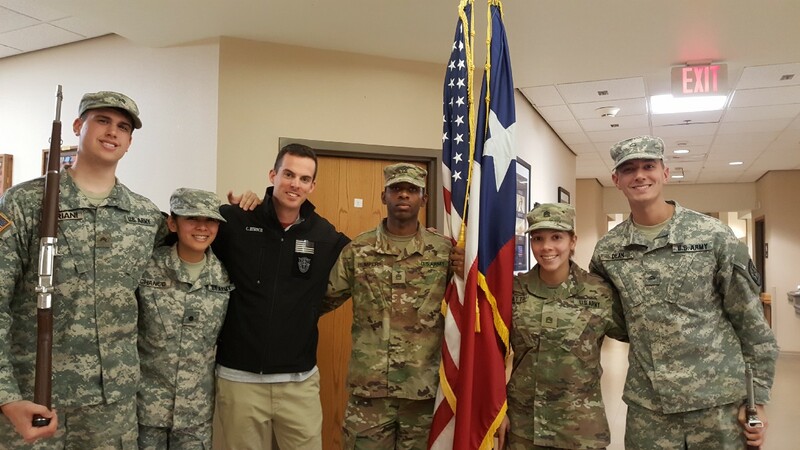 Troops from Fort Hood volunteered their services and a photographer took family pictures for the Veterans and their loved ones as keepsakes. 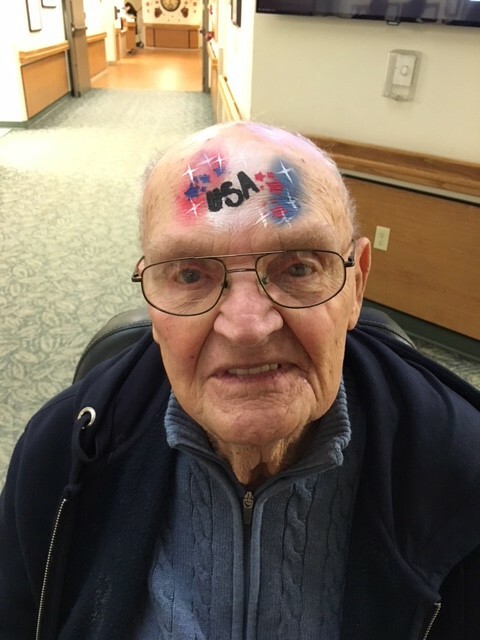 The staff at the Veterans home work very hard to prepare for this event. 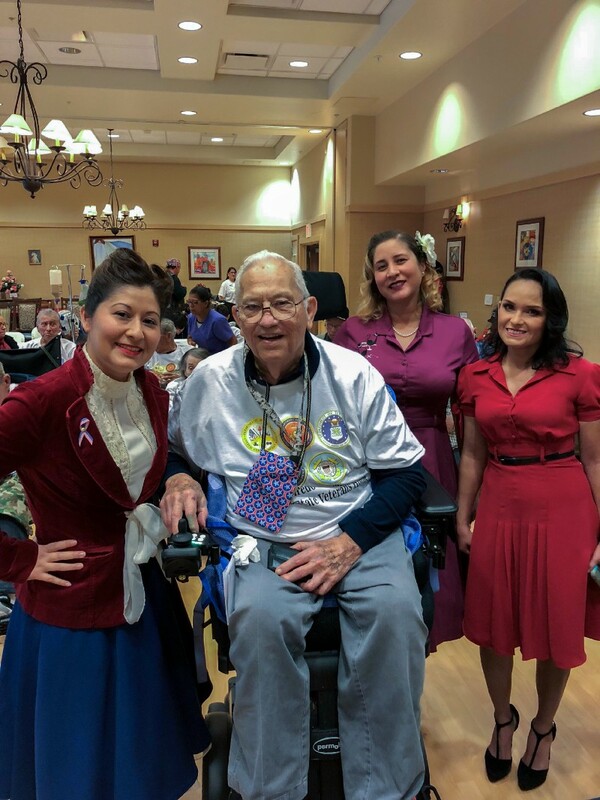 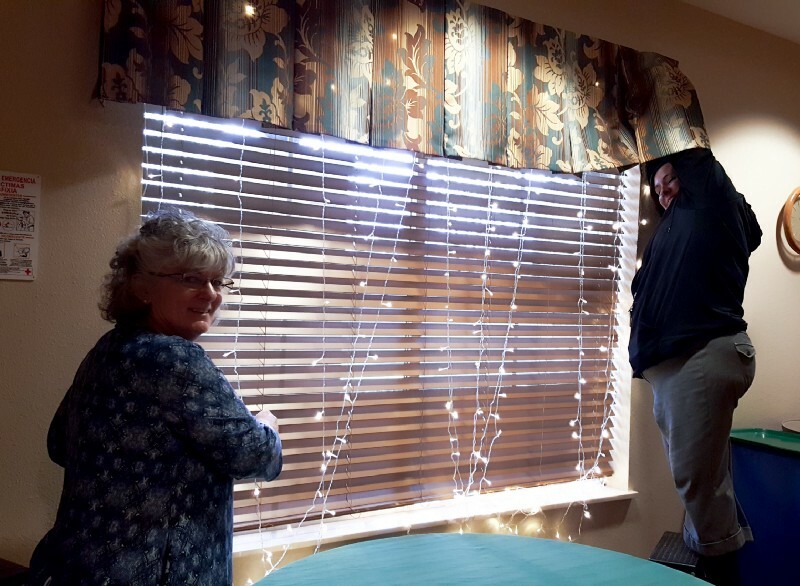 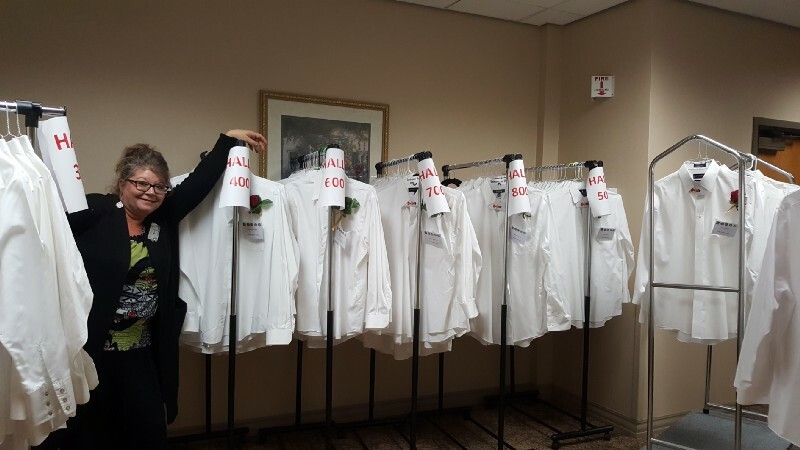 They make sure that each Veteran has a clean pressed white button down shirt to wear and spend hours decorating and setting the tables. 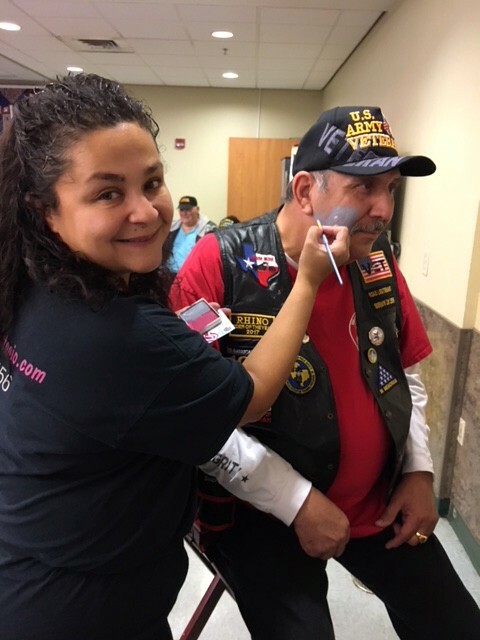 Because of their hard work and extra effort our Veterans and their families had a fantastic evening! 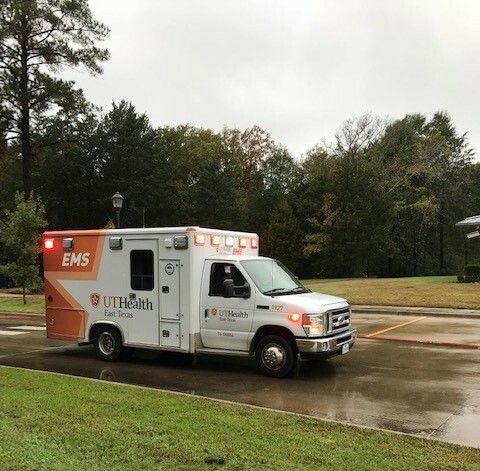 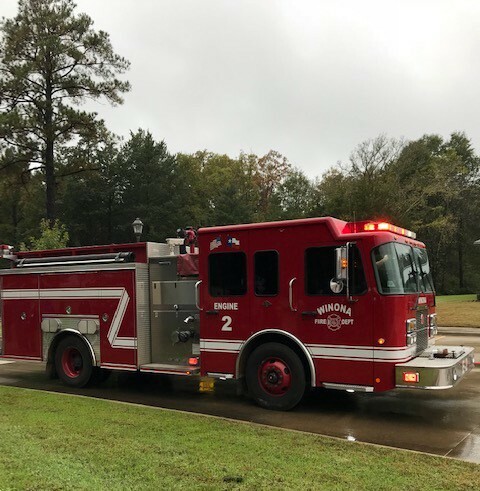 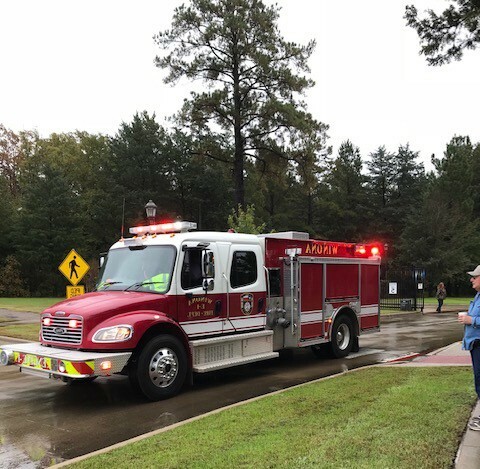 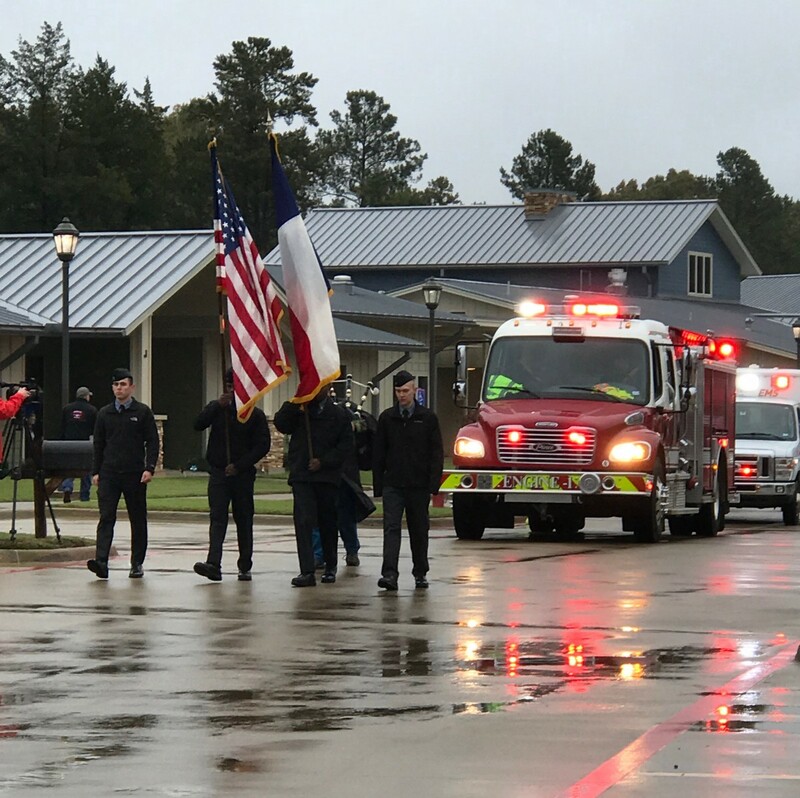 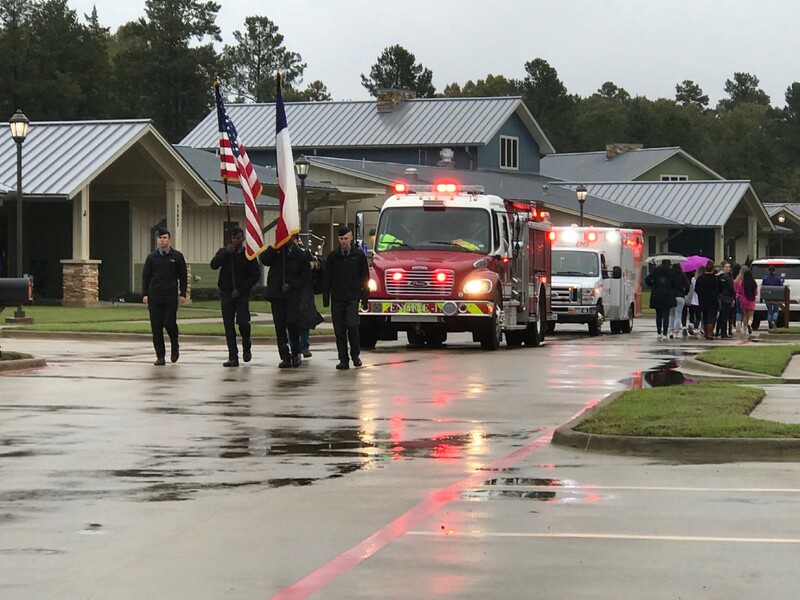 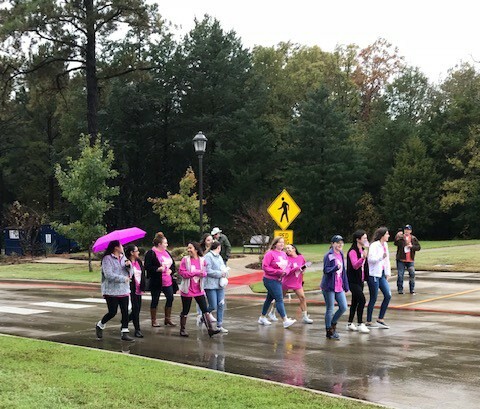 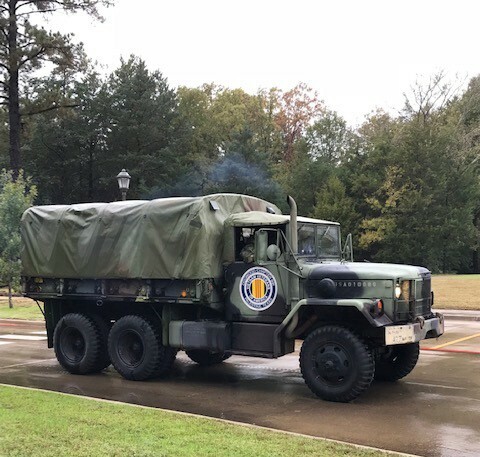 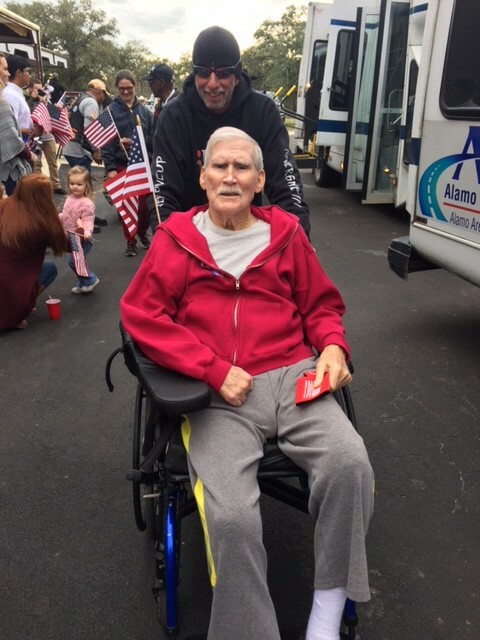 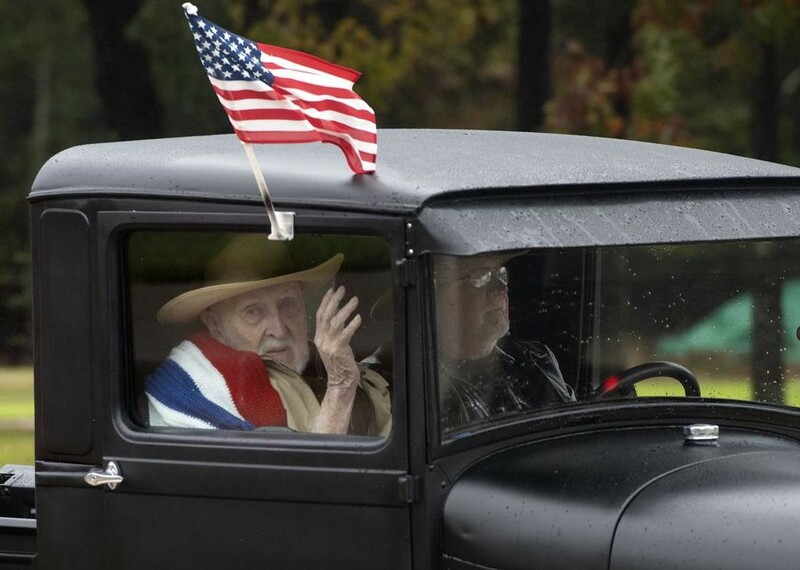 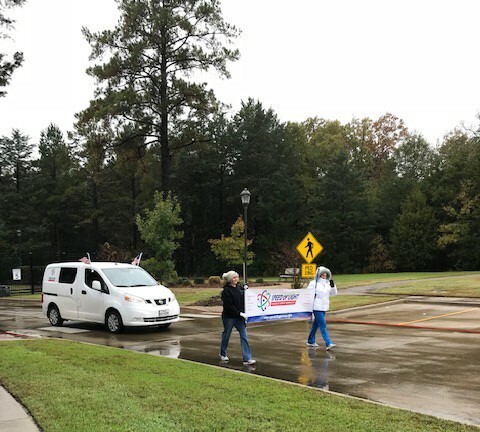 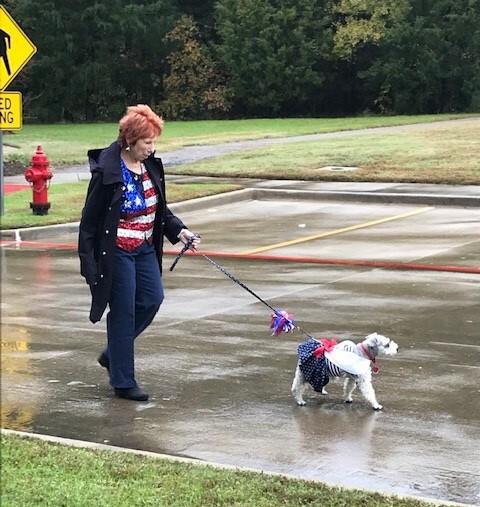 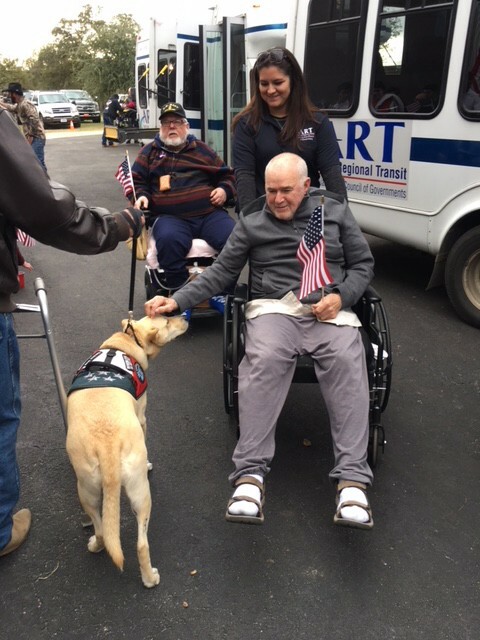 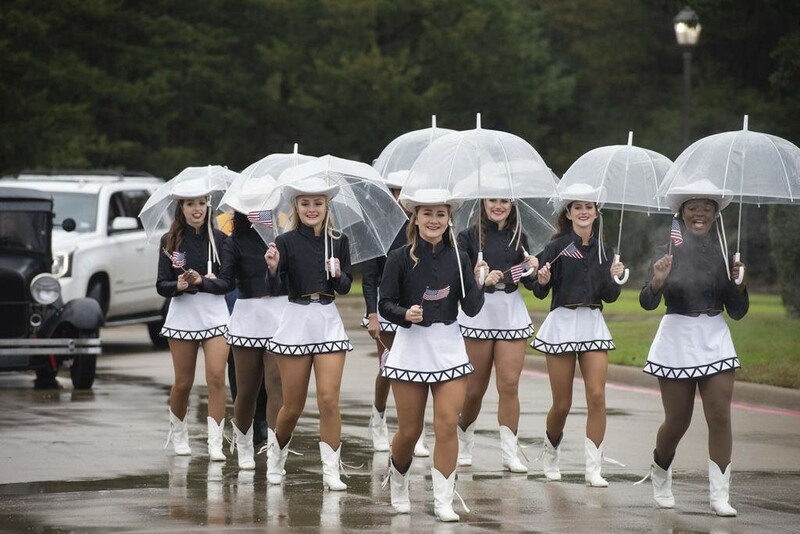 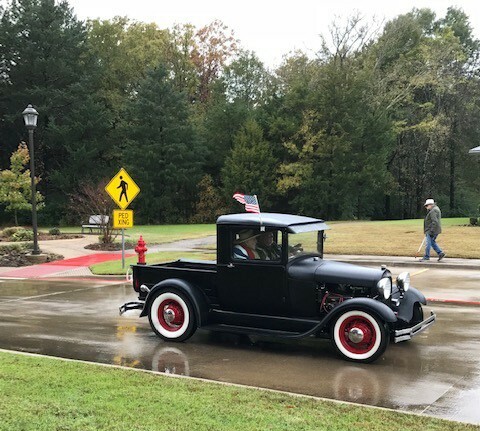 The Texas State Veterans Home in Tyler held it’s fifth annual Veterans Day Parade on Monday, November 12, and the Tyler community joined in the festivities to pay tribute and celebrate America’s Veterans. 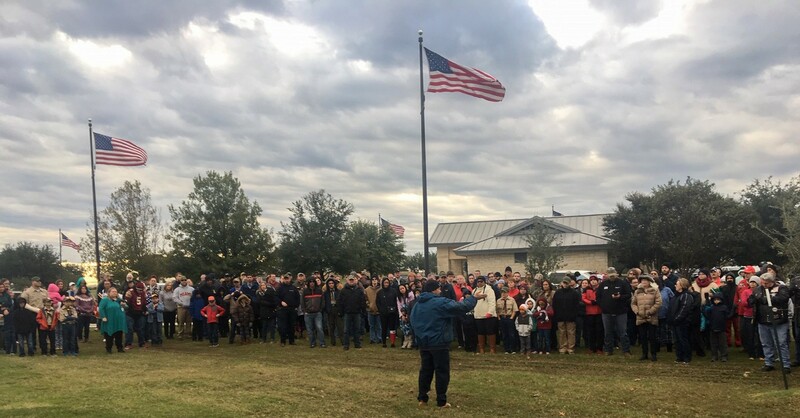 The public was invited to attend flag laying ceremonies at any of the four Texas State Veterans Cemeteries throughout Texas. 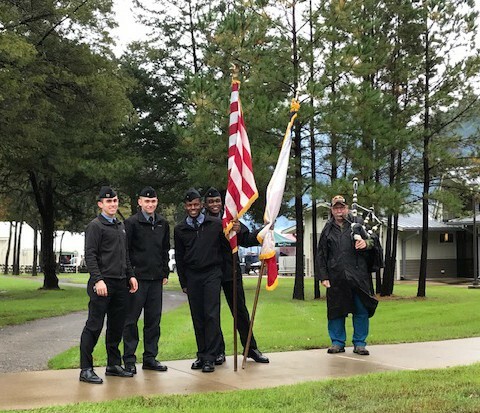 Community volunteers and cemetery staff placed U.S. flags at each gravesite in recognition of Veterans Day. 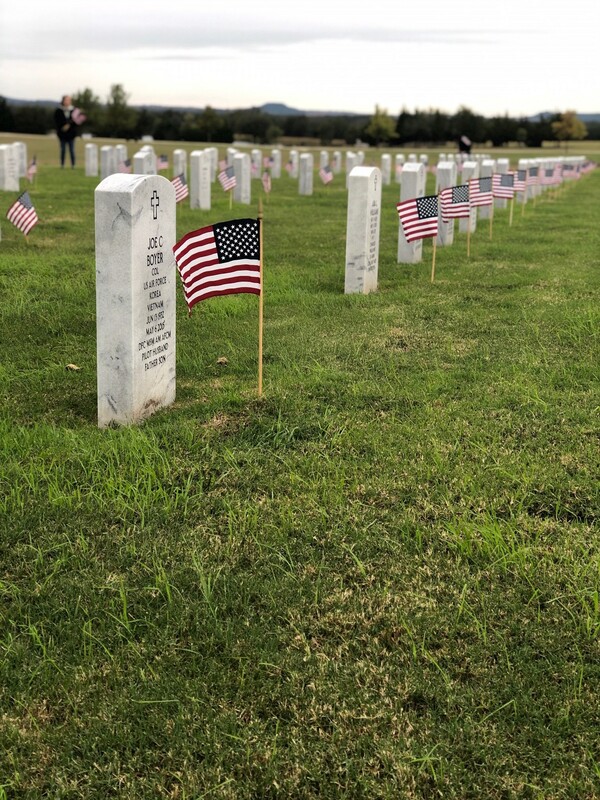 Members of the Central Texas community placed over 8,360 flags at the Central Texas State Veterans Cemetery in Killeen in 15 minutes! 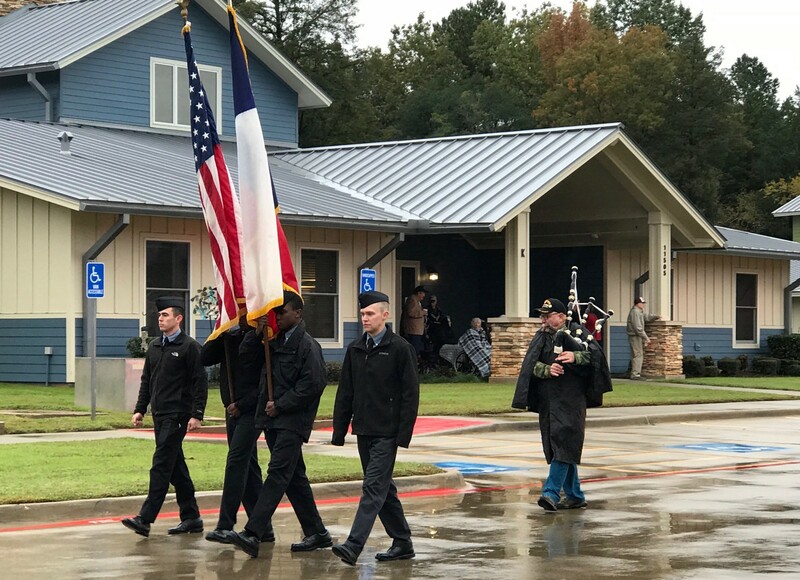 All four Texas State Veterans Cemeteries carillon bell towers tolled on Veterans Day, November 11, 2018 at 11:00 AM. 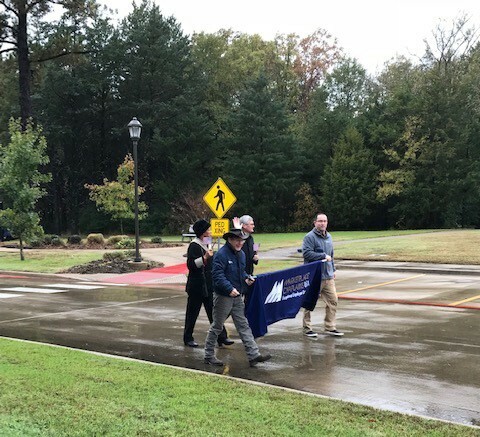 Joined together with the United States World War One Centennial Commission’s “Bells of Peace,” the tolling bells served as a reminder of the sacrifices of those that served during one of the deadliest conflicts in world history. 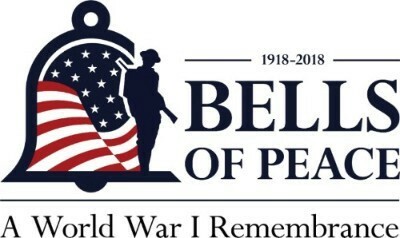 In total, four million Americans, including 200,000 Texans, proudly served during World War I. 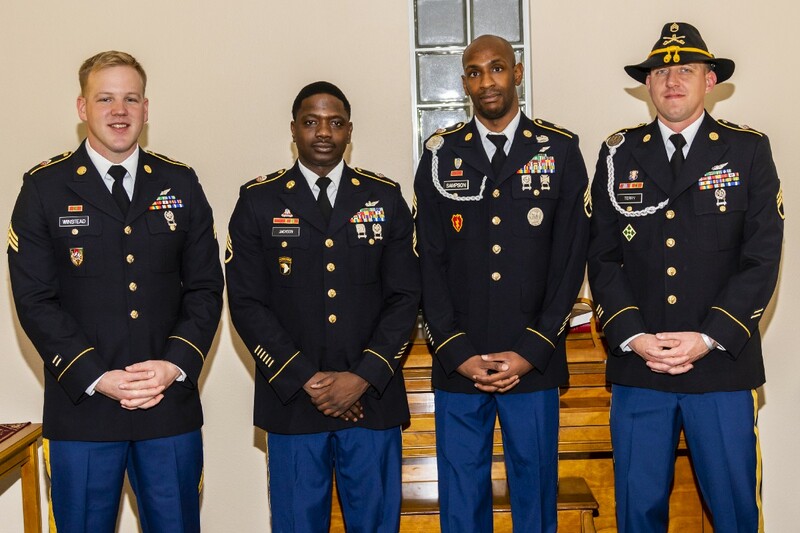 The tolling of the carillons commemorated the 100th Anniversary of the World War One Armistice.